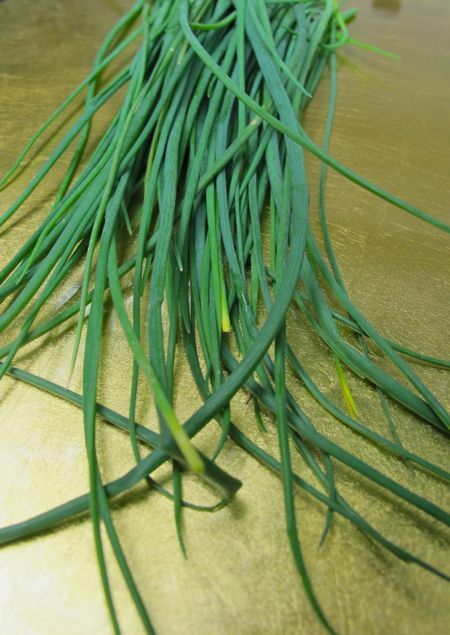 Besides the radishes in last week’s “shipment” of produce, I also got two bunches of fine chives. Not garlic chives or chinese chives, but western chives. They are NOT easy to find in Manila, unless you get lucky at Santis or some of the weekend markets. With a mild onion flavor, they are superb in somedishes that need a hint of onion, but not too much… think a garnish on any number of smooth creamy soups or bisques, or on top of mashed potatoes or in cream cheese. you’re so lucky to have GEJO! access to fresh, hard to find produce. 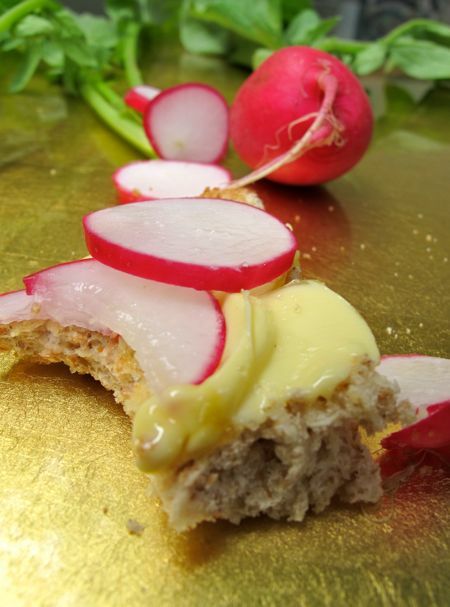 i never thought butter would pair well with radish. i’ll look forward to seeing your sharp side salad using the mustard greens as garnish. Ravishing radishes alright! Just got my supply of pink Himalayan salt, 9.5 oz for $10, and some Maldon sea salt also, good stuffs! Have you tried roasting those radishes, MM…tops and all? 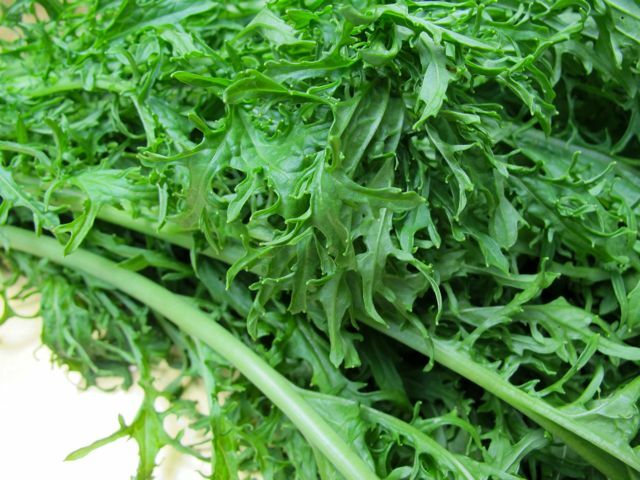 The tops turn into wonderful crisp greens much like oven roasted kale….light drizzle of olive oil on the greens but NO SALT yet! Add a touch of salt when they are nice and crisp! Oven roasted kale is our new addiction! You can even vary the seasoning on the roasted radish greens….try the Japanese seasoning, or the Korean ones for zip, or for an Indian flavour, cumin, coriander and touch of garam masala. 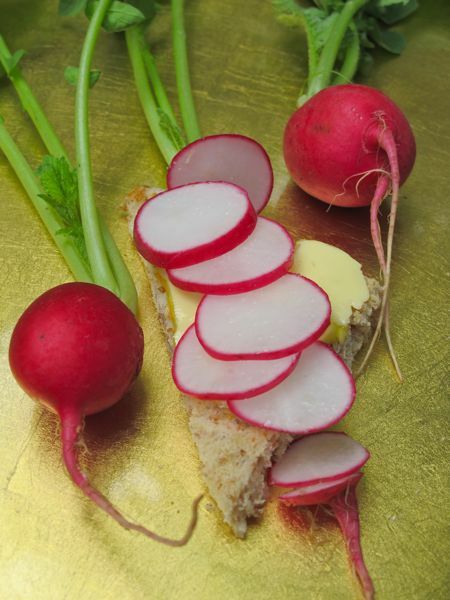 The seasoned oven roasted radish green make a nice side dish to the open faced radish sandwiches! Thanks MM! Glad you liked the produce. It’s always a thrill to read your posts on them. “Ravishing radishes” – !. Kamusta betty q?! Did the seeds come through? Hope you received my e-mails. I’ll try your roasting suggestions too! All through the seventies and eighties, I guess until Asian immigrants in Toronto reached critical mass, you could only get white radish in China town which required a special trip. We therefore used these tiny radishes as substitute for dishes such as sinigang and kilawing librillo which gave the cooked dishes a pinkish glow and had the advantage of not giving off a broken winded sort of unpleasant odor as the normal labanos or lobak do. Aren’t mustard greens added to fish (usually sea catfish, kanduling bungulan) sinigang with miso? would never recognize those lazy greens as mustard greens. you mean they’re peppier than the broader ones used for sinigang? MM, did you know that those broad mustasa leaves make a perfect wrap for lechon? the bitterness cuts the grease perfectly. i’ve always bought those radishes because they looked cute in salads,but have never developed a liking for them. but you can’t go wrong with butter, right? can’t wait to pick up a few so i can try this out. no bacon, nothing else, right? had an OMG moment when i read your description of the chives. i have several clumps of them growing lustily in the garden, from a small clump given by a landscaper friend. i have bemoaned the fact that they are not the familiar flat “kuchay” (chinese chives), but i tried to be brave, and have used them liberally in stir-fried ground pork with water chestnuts and a bit of oyster sauce. thanks, Gejo and MM, for continually updating our knowledge about veggies, and for giving us the courage to try new things all the time. MM I just cooked Beef sinigang last friday and use red radish which is much cheaper than the white radish we normally use. Millet…those chives can be invasive! If you want to contain them, best you cut out the bottom of a huge pot and bury the pot with the chives in it! Nice.nicer if you can replant some with visible roots still on..nicest when you harvest it then have them atp its freshest. I am generally not a radish fan either although my partner who is European adores them for breakfast (yes, on buttered bread). But a couple of years ago I had a miso-braised radish (daikon) dish in a Japanese izakaya that was revelatory to me. bettyq, thanks for the roasted radishes tip. We roast a lot of vegetables (brussels sprouts, cauliflower, broccoli, parsnips, carrots, etc.) and make kale “chips” in the oven as well…they are addictive. The topic of leaves and mustard greens reminds me to fix this mustard green salad, best when you get the freshest greens, especially now that vegetables are in abundance. Thanks to the unseasonal rains. Salt finely chopped mustard greens and let stand till slightly wilted. Squeeze the greens of its juice then wash and squeeze well. Toss greens with finely chopped salted egg. Drizzle with vinegar and serve. Perfect accompaniment for inihaw: fish, chicken inasal or pork	. Millet…maybe try roasting them and you will be addicted to it! Serve them or eat them warm and dip them in COMPOUND BUTTER…waaaaaay even better!..no need to salt them! C’mon mga Mrs…. ROAST your radishes! a nice addition to your antipasto tray! Every year, I have a whooooole row in the garden just for radishes! 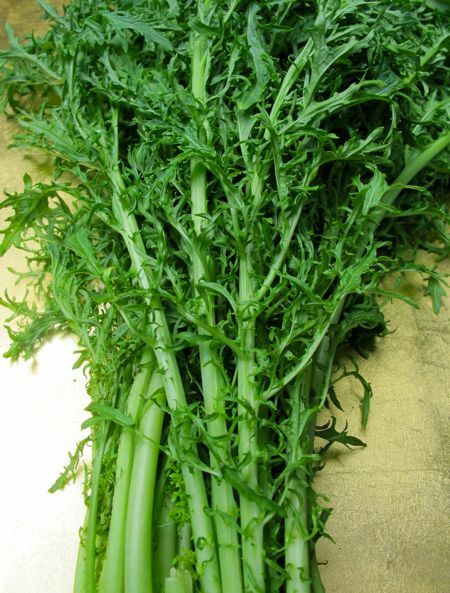 Kurzhaar…there is a new vegetable this year called FLOWER SPROUTS…a cross betweeen brussel sprouts and curly kale. You also like kale chips? This FLOWER SPROUT looks like a tiny kale but grown on a stalk similar to brussel sprout stalk. When ready to harvest, they look like an opened brussel sprout! I am growing it this year once I get hold of the seeds. I only found 1 US supplier so far. If you want to try planting it this year…JOHNNY’S SELECTED SEEDS has them…..and no, I am not related nor do I work for them! MM…maybe you can pickle the mustard greens…much like pickled ampalaya you still have a tinge of bitterness but not overwhelmingly so! Betty q…My friend plants a lot of kale in her garden and gives me when she harvests but I only know how to put it in sinigang or nilaga. Will surely save your tips in my USB for future use. Radishes and kales to be oven roasted from here on…Thanks!! Wisdom tooth: make sure the leaves are DRY to the nth degree! Blot the moisture with paper towels or give it a whirl in your salad spinner…..light drizzle with olive oil or peanut oil (if no one is allergic to peanuts) to coat the leaves. Do not salt them yet…if you do, the salt draws out the moisture and they will not turn crackling crisp. Salt them after. We prefer the hickory smoked salt….others you might want to try…the nacho seasoning or barbecue seasoning. It is like eating potato chips only green! 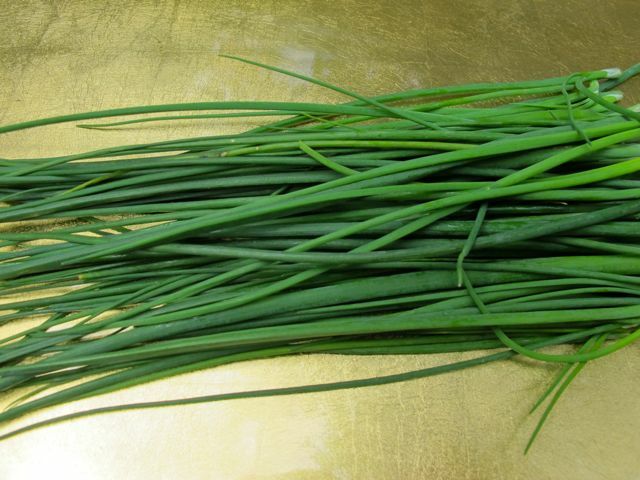 PS – those “Western” chives look fantastic, sturdy. Etc. The ones in my local market are slimmer, tidier, trimmed… Though they taste fine. Don’t know if you’ve been following the “French women don’t get fat” controversy, but I can assure you French chives are svelte but still have ooomph. Hi MM: Those look like Mizuna mustard. Great for salad.